This past week I finally decided to migrate to a new bug tracking system for my personal projects. Granted, my projects aren't particularly big (in most cases, I'm probably the only user), so it's not like I'm flooded with bug reports. But in my last two jobs I lived and died by our ticket tracking system and found the use of a good bug tracker to be extremely helpful for my development process. For the last few years, I've been using Mantis BT for my personal bug tracking needs. Mantis is actually a very capable bug tracker and worked fairly well for my needs. However, Mantis is just a bug tracker. It doesn't have a wiki or much in the way of project planning tools, release management, or anything else, really. It has some basic roadmapping features and a changelog generator, but that's about it. And since I've become used to working with the likes of Jira, Trac, and Phabricator, I've come to want a little more than that. On a side-note, the other thing about Mantis is that it's a bit cumbersome to work with. The UI is a bit...antiquated, for one thing. In fact, I've heard people refer to it as a disaster. There's a reason that the Mantis site only shows screenshots of the mobile app, as seen from the issue reporting screen below. The workflow is also a little weird when it comes to things like the changelog and roadmap features. It centers on fixed-in and target versions for individual bugs, which presupposes a more organized type of release planning than I'm looking to do. I run this site on a shared hosting account. A really cheap shared hosting account. To expand on the "cheap" part, my hosting provider is really targeted more at simple PHP-based sites that are administered through their control panel. So not only do I not have root access to the server, I don't even have shell access - just the control panel and FTP. So anything that requires running interactive commands for setup is out. And while my host does "support" Ruby and Python, in the sense that the interpreters are installed and accessible, it only does so through CGI and has a rather limited set of libraries installed. This all leads into the second point, i.e. laziness. I could just get a more full-featured hosting provider. However, I've been happy enough with my current one, they're very affordable ($6/month), and frankly, I can't be bothered to go to the effort of moving all my stuff to a new server. I also can't be bothered to figure out the non-trivial steps to set up a semi-supported package like Trac or Redmine on my current host. It just isn't worth the time and energy to me. So I decided to do a little more research. After some Googling, I ended up settling on The Bug Genie. So far, it seems to be a pretty decent compromise between Mantis and something like Trac. 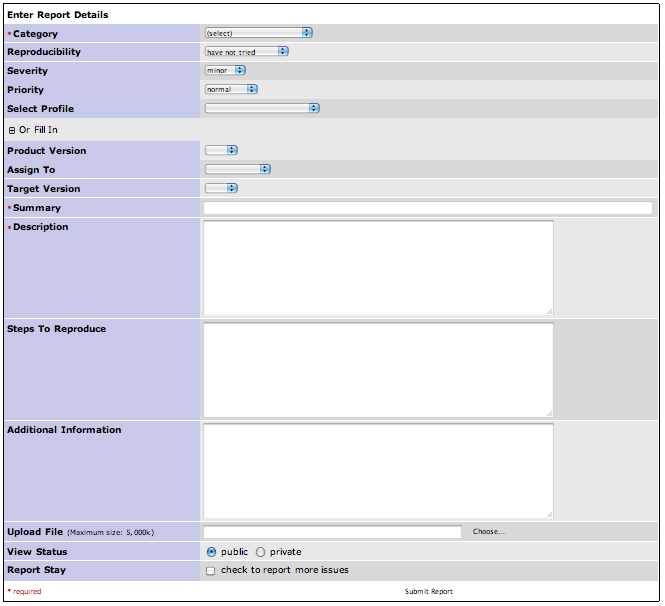 In addition to ticket tracking, it has an integrated wiki module, release and milestone tracking features, and even source control integration. The initial setup was not as intuitive as I might have hoped. For starters, there was no easy way to migrate my data from Mantis to The Bug Genie. I ended up just migrating the issues themselves, minus comments, by using Mantis's CSV export. A highly sub-optimal solution, to say the least, but it wasn't important enough to me to make a project out of the migration. Second, the permission and user system, while it seems pretty powerful, is a bit more complicated and granular than I need. Lastly, the source control integration was a bit of a pain to set up. The actual configuration wasn't that difficult once I figured out what I needed to do, but I had to go to the project team blog to find the documentation I needed. Honestly, the worst part was the particular format of commit message needed to trigger the integration - it's quite verbose and not at all intuitive. It's only been about a month of fairly light use, but so far I'm pretty satisfied with The Bug Genie. The UI has its quriks, but is modern and easy to use. 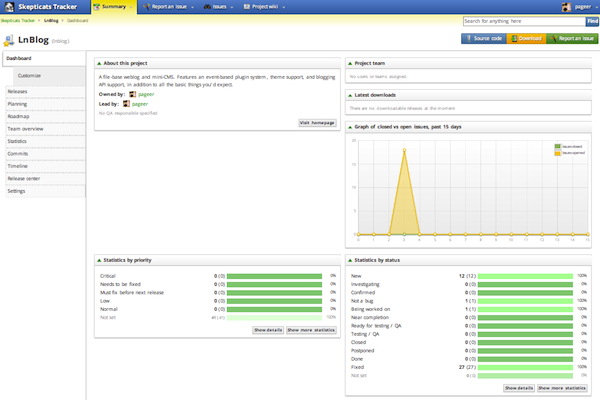 It's pretty configurable and well documented, allowing you to customize project pages using the wiki module. Things like the release tracking and VCS integration are nice touches and seem to work quite well. All in all, it pretty much does what I wanted and does it reasonably well. I'm pretty happy with it. Hi, could you please (pretty please) tell me who you chose for hosting? I've been with them for about eight years. Their service has been pretty reliable - I've never experienced any problems with it. The price is pretty good, too - I just use the "economy" plan, which is only $6/month. The feature set is not particularly impressive, but it's sufficient for my needs. And given that I'm otherwise satisfied with their services, I'm not inclined to change hosting providers. Enter the sum of 95 and 27.